Ministry and transitions seem to go hand in hand, as time ticks on the ever-changing river of life goes on winding in and out, leaving ministry workers regularly relying upon God for His guidance. This article is pin-pointed to help those in a ministry transition between one job or service and the next, for those who may have months or years between “official” ministry titles and vocations. It’s not an entirely unique situation, although it may feel like it, to be in a holding pattern until the Lord makes clear the next path He would like you to travel. I don’t know if you’re like us but when we travel on long road trips we often prefer to stop at rest stops, following the blue sign into the area, taking a bathroom break and allowing our 5 children to run around and stretch their legs. Transition times should be thought of as a Rest Stop, not a stopping place to get settled but a location where you can break away from the life you’ve lived and take a breather before stepping into the next place God is moving you. We personally took a 2-month break to travel. First, we rented a cabin and spent several days in the mountains hiking with our then, four children. Next, we traveled to see family and ministry friends in between moving from one state to another. We had time and we had money because God had provided both of those things for us. It also happened because we made it a priority to rest and do something different. If your family needs rest, find a Rest Stop. The Bible speaks about making hasty decisions (Proverbs 14:29, 19:2, 21:5, 28:20) and one of the worst things you can do is to hastily jump to what looks like an ideal opportunity just because you’re desperate for a place to work and live. Or because the opportunity you are presented with seems like the ideal opportunity you’ve been dreaming for. Not to burst anyone’s bubble, but all that glitters is not gold even in the ministry world. You don’t want to find yourself compromising standards or convictions because you flew too quickly at the first offer presented. I’ve heard many stories about how people who had a bad ministry experience in their first ministry who quickly went on to another church to only have another bad experience because they did not know the pastor or ministry where they were going well enough. Others found that while the pay was good at their ministry position, it caused a lot of sacrifices in other ways they were not expecting. I am sure most of us would never be guilty of praying too much about a situation (we don’t pray enough!) but family transitional times are KEY times to invest in solid and dedicated fervent prayer time. You want to have peace and confidence in knowing where God is leading you so that no matter what occurs in your next ministry experiences you can rest in the fact you followed God’s plan for you and not your own. Waiting on God is not for the faint of heart. It is like the dog trained to sit still next to its master as its beloved ball is thrown into the grass. The dog waits eagerly and will move impatiently in that spot until told “Go fetch!” and it runs furiously to retrieve its prized toy and return it for another round. You may wait in anticipation with no ball to retrieve for a while, but it does not mean that your obedience in waiting is wrong or ill-timed. We often align our ministry thoughts with the common idea, “If you’re not moving you’re dead,” and the unsaid philosophy of accomplishment being a goal to be achieved greater than obedience. Patience is a fruit of the Spirit that must be trained and allowed to grow in the times of waiting for God to work and move you into the next place of service. Backsliding can easily occur in a stepping out by faith process. Faith is the substance of things hoped for, the evidence of things not seen (Hebrews 11:1). When you cannot see faith and what it consists of on a daily basis, because it is intangible, it is easy to become backslidden. You can rest in what you know and get comfortable with the waiting process. Backsliding is a natural fleshly response away from spiritual growth. The longer the wait the more temptations you face, especially if you are no longer serving in a church regularly and your spiritual accountability has lessened. We spent five months discerning the Lord’s will on where He would have us go so we attended a small church for a while. Then, after we felt God moving us to my husband’s home state, we joined the church where my husband grew up and attended there for about six months. Then the Lord led us to help in a church planting ministry where we served for around 18 months. God recently moved us into an established ministry with my husband as the music and choir director. He does bi-vocational ministry work now. The danger some ministry couples get into is that they think they can fly under the radar and church-hop to an extent visiting other ministries instead of finding a pastor and church. Visiting and attending can be good, an encouragement, but should only be done on a short-term basis. We, even ministry folks, need to be a member of a local church for spiritual accountability and growth. Even if you are not fulfilling every role you ever did before in ministry, you can and should use your talents and skills in some way serving in a local church. It will keep your mind busy and your heart tied to God and His work. Rest Stops are great places to fill up your personal and spiritual gas tank. We personally used our couple time in the evenings discussing spiritual matters, goals, and desires for future ministry. We read books and internet articles to sharpen us as we waited. Think of yourself as a Bible student that can take time to study particular topics of interest or grow in areas needing attention. Whatever additions you can make into your spiritual life can be used in the future. Invest in your family! During our transition we enjoyed our family time differently than when we had a full ministry schedule. This in it’s own way helped us reshape our family values and see particular needs in the hearts of our children that needed to be cultivated and attended to differently. Whether your kids are young or older, investing in your family is never a waste. When in times of waiting it is easy to look at others while you are on the sidelines, comparing and wondering. You can begin asking yourself why another family may have left their ministry and received a new position quicker than you have. We cannot see from a human standpoint how God is working on our behalf. His mysteries lays out a path for a particular family in one way and designs another family’s place of service and ministry uniquely for Him, and are His secrets and His purposes. Don’t be jealous of your friends or other servants of God, don’t be mad at God, just trust in His timing and be thankful God is faithful to those who are His servants. Take the next step toward ministry. Join a church and serve. 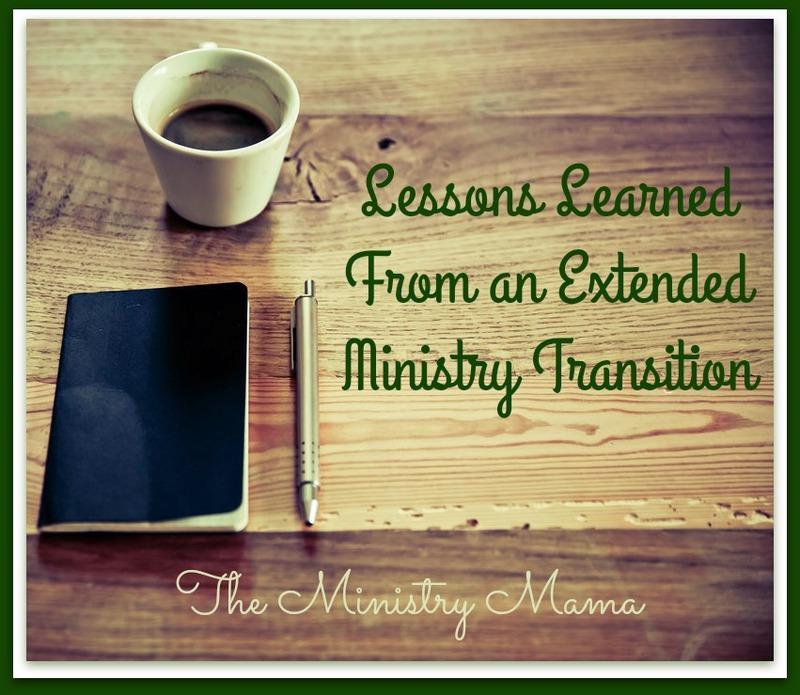 These are the lessons we have learned from a ministry transition that took a lot longer than we expected. We hope someone will be able to take our lessons learned and be able to make sense and purpose of their own ministry transitional time. Keep in the Word friends and keep serving the Lord! Today I want to extend my sincere love and thanks to my most faithful encourager and my darling husband for ten years of marriage. My husband, who I like to call on the blog, The Ministry Papa, is a special person to have put up with me for so long. My husband is a wonderful person. I admire him for loving others and always making them feel welcome and valued. I love him for always saying to me when I approach him asking for forgiveness, “I already forgave you,”because he has tenderly already chosen to overlook my wrongs. I love how he tells me that if I die then he will never want to marry again, even though I encourage him it would be okay. He really needs a helpmeet! Trust me, I know. I love how when I am not self-confident he has uplifting words to say to help me feel secure. He is an assuring friend, an adventure waiting to happen, sometimes a magnet for bodily injury but that’s something that keeps us laughing. He is concerned about our life and future, wants to follow and obey God so that we do not have more years of heartache if we can help it. He is the fun-loving father that delights to wrestle on the floor with our kids and take them to do things with him. He is careful in the things that he is good at, like painting, preaching, and the joyful way he leads the song service in our church. I love the sparkle in his eyes when he sees me. He is my dear, my darling one! On a Side Note…Did you know that darling means, “my only, as not to be replaced”? It does, and that is why I call him that. We have not been exactly in the same place for each of those days, hours, minutes, or seconds, (thankfully) but we have been considered “one flesh” for that long. It is a sobering thought to think of all those times shared add up to so great an amount of time. Half of our marriage was spent as some of the most stressful years of my life as we lived our earlier days working, having our boys and finishing Bible College. The last half have been spent serving in our first ministry together and they have allowed us to have a “normal” schedule and be able to communicate so much better than the years beforehand. You can read more about our earlier years of marriage on a guest post that I wrote here. Love is an interesting thing. I cannot express any thoughts or ideas that are new in the world about the subject but I am thankful that I have it and through God our love is richer and deeper. In serving in the calling of God’s will for our lives it has made it at times more complicated but overall more meaningful because I believe that it will have resulted in eternal gain for God’s glory. Heaven will show something of the love we had as we served the Lord together in our church, gave money for worldwide missions together, and most importantly taught our children about salvation side by side. You may notice that I write more often about ministry and motherhood than I do about marriage. 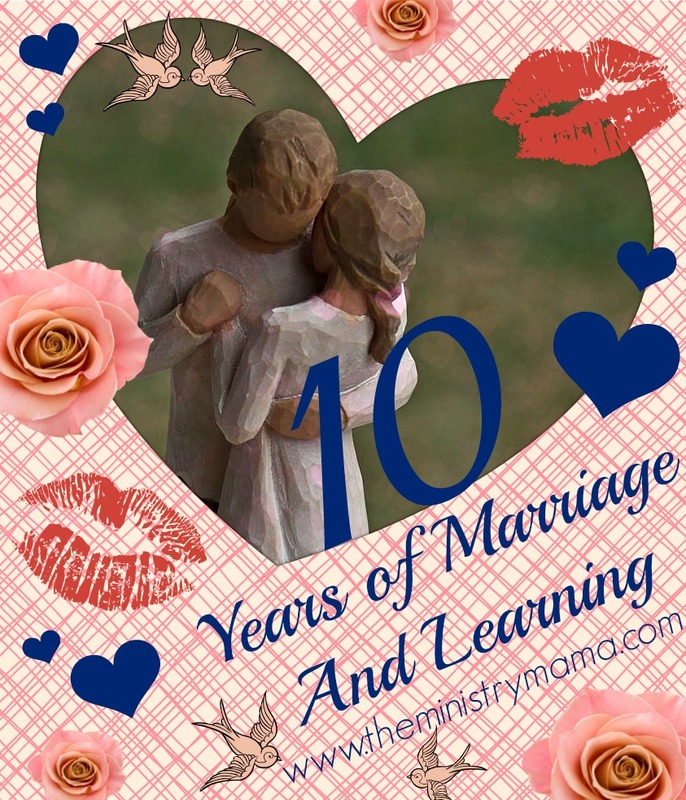 In so many ways I feel like I struggle in this area of my life most, so that is why I titled this “10 Years of Marriage and Learning.” We are still learning how to love and serve each other. Lord willing, we will always be learning to love and serve each other. Someone said in a sermon once that marriage makes you learn how to be more like Christ… and I think it makes it clear when you’re not being Christlike at all. Marriage has stretched me, humbled me, called me to forgive more times than my fleshly heart wanted to. 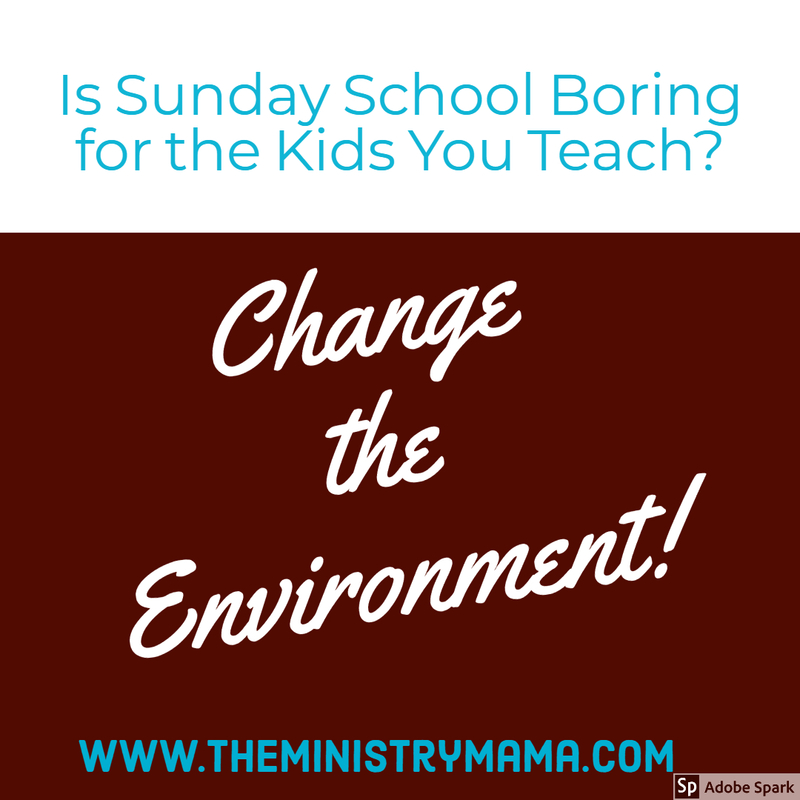 It has taught me forbearance, patience, to keep my yap shut and wait for God to work in my husband’s heart instead of trying to constantly be the pushing force of change in my husband’s life. It has revealed that although I have a wonderful companion, that God is the One who really knows my thoughts and feelings every day and He is the one that will help me change MY heart more than his to help make this marriage what He wants it to be. Being married to my husband has made me a better person. I won’t lie, neither of us has been a picture perfect example of a wife or husband every day of these 10 years, but I Iove how that no matter what God has helped us moment by moment get through the turbulent seas and teaches us each time that true love covers a multitude of sins.